This is Natalie. 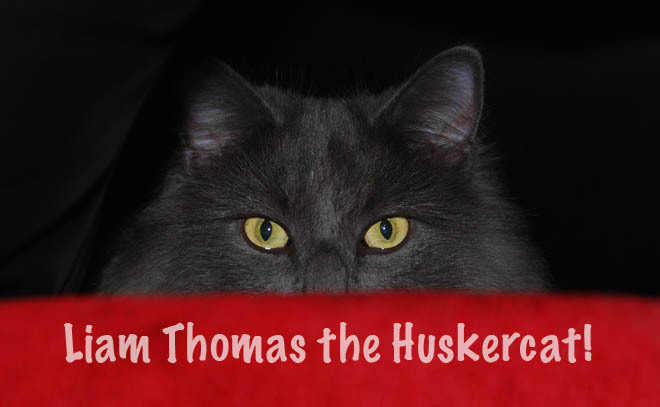 I'm the Huskercat. So it's probably pretty obvious how thrilled I was to have her come visit me and she's dressed in this lovely husker sweater and red head band. I'm not big on fashion (other than I like fur coats), but I'm easily won over by her. She really pulled me in and hugged and squeezed me silly (see photo). All that and she smells good too. Us cats use our whiskers and our sniffer to evaluate what's going on around us. And she was a lot going on around me. This one is special and she is invited over anytime she wants!